Comparison and chart of E-Z Flex II TMJ exerciser, OraStretch press, and TheraBite jaw motion rehab systems for trismus, jaw disorders, and facial dysfuntion. CranioRehab offers three devices for therapy and rehab of the mouth, jaw and TMJ with stretching and passive motion, including: the E-Z Flex II exerciser, the OraStretch Press and the TheraBite System. With natural motion of jaw. With natural motion of jaw. With external hinge. Please call us at 1-800-206-8381 for more information on these devices. The E-Z Flex II exerciser, OraStretch press and TheraBite jaw motion rehab systems are handheld units designed to stretch a user's jaw to treat trismus, dysfunction and hypomobility. The devices use passive motion to stretch the user's jaw, joint and facial tissues for increased mobility, flexibility, and function. By utilizing a jaw motion rehab system, a user can increase their range-of-motion, improve their jaw and joint function, and reduce swelling and pain. 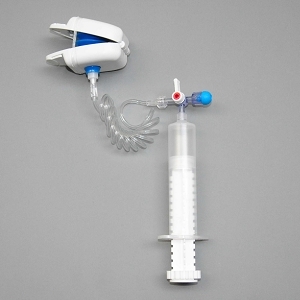 The E-Z Flex II uses a pneumatic syringe and pillow to provide air-cushioned passive motion and static stretching for treatment of TMJ disorder, jaw dysfuntion, and trismus. 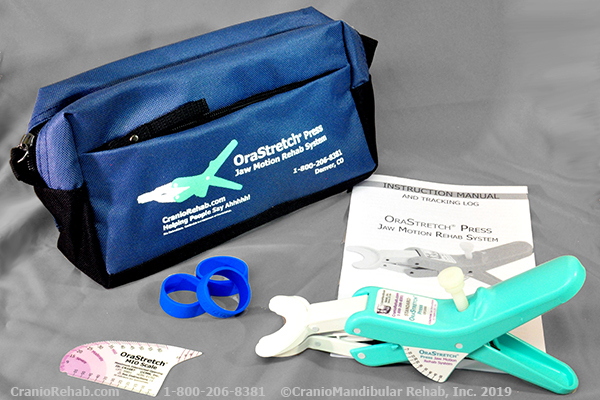 The OraStretch Press and TheraBite devices provide passive motion along the curved natural rotation of the jaw to spread the pressure across the teeth to treat and rehabilitate the jaw, temporomandibular joint, and facial tissues. All devices utilize general mouthpieces with foam pads and do not require custom splints. 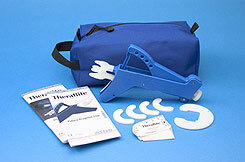 Special pads (edentulous pads) are available for patient with dentures on the OraStretch press and TheraBite devices. All products bill under the E1700 HCPCS insurance code and have the same insurance coverage. These systems are clinically proven as more effective than self-exercises and tongue depressors for increase oral range-of-motion. The systems are also easy to use and portable, allowing patients to perform their necessary therapy while continuing in their daily life. A jaw motion rehab system should only be used under the guidance of a medical professional. Jaw motion rehab systems have been studied and successfully tested in clinical trials of post-surgical and post-radiation trismus, TMJ disorders, and traumas. Recent studies also indicate efficacy for treatment of orofacial pain and non-surgical TMJ conditions. *See the product page and Terms and Conditions for more information.